All young girls love unicorns, which makes this theme perfect for a birthday party. This article looks at ideas for a unicorn themed birthday party. Unicorn Party Supplies make putting together that unicorn birthday party even easier. In addition to the tableware, decorations and favors there are also unicorn invitations and even a cute little unicorn beanie baby. In addition to looking at all the different unicorn party supplies, we’ll also provide some ideas and tips for fun unicorn activities and games. Continue below for ideas on how to make the best unicorn birthday party! Coloring Activity: This , of course, is an obvious activity. All girls love coloring. 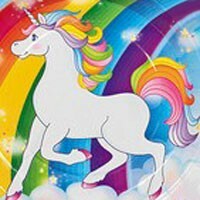 Either use a unicorn themed coloring book or simply have the girls color unicorns and rainbows; or whatever they like. Plus, crayons are very inexpensive and make great additions to favor packs. Create a Forest: Unicorns live in the forest. Why not have the kids create a forest for the unicorn? For supplies, you will need green paper, brown paper, tape, glue and kid-safe scissors. Have the kids cut out a circle like shape for the top of the tree from the green paper. Then, have them cut out long, rectangular shapes for the base of the tree from the brown paper. Glue the top onto the base, and then have them tape the trees around the house. Find The Unicorn: This game is based off the idea that unicorns are shy and elusive. Very simple and fun: first, you need to get “Mystic the Unicorn” Ty beanie baby to be the unicorn. Next, hide the unicorn someplace in the house, yard or wherever you’re having the party. Then, have the kids search for the unicorn. Pin the Tail on the Unicorn: Based upon the “Pin the Tail on the Donkey” game, this instead involves a unicorn and rainbow tail. Draw or buy a large image of a unicorn, cut out the tail, then create a rainbow colored tail. Grab a blindfold, and then have each kid take turns trying to pin the rainbow tail on the unicorn. Tape is better to use than thumb tacks so that the kids don’t accidently poke themselves. Unicorn tableware is an essential part of any unicorn themed party. Rainbow unicorn dinner and dessert plates featuring a cute unicorn are perfect for eating cake and ice cream on. Complimenting the plates are the unicorn lunch napkins, which also feature the same theme design as both plates. Each plate package comes with eight dinner or dessert plates, and the napkins come in packages of 16. In addition to the plates and napkins are unicorn themed cups and the unicorn themed plastic tablecover. The 9-oz cups continue the same cute unicorn and lovely rainbow colors pattern and come in packages of eight. The tablecover features a beautiful scene featuring the unicorn prancing over clouds and rainbows. Measuring at 58” x 108”, the unicorn tablecover helps round out the unicorn theme. All unicorn tableware is inexpensive and will help make that unicorn themed birthday party extra special. Of course, both the unicorn decorations and favors are also essential parts of a unicorn birthday party. Although, the unicorn theme decorations are currently limited to just a centerpiece, other decorations can be used to compliment the theme nicely. Streamers and balloons come in a variety of colors, including blue, yellow, green, red and purple; plenty of variety to create rainbow effects throughout the party area with. In addition, there are a variety of rainbow colored candles with numbers ranging from 0 to 9; making it easy to create a unicorn birthday party tailored to any age. Plus, it would be easy to get a little creative with the pony cake pan. Simply use white frosting for the body, rainbow colored frosting for the hair and swirls of white or rainbow colored frosting for the horn. Unicorn themed favors consist of unicorn stickers, favor bags and “Mystic the Unicorn” Ty beanie baby mentioned above in the activities and games section. Each sticker sheet comes with 12 stickers, and the unicorn favor bags come in packages of eight. Another idea to round out the favors is rainbow derbies (hats). Plus, it would be fairly easy to add a horn to the hat; turning the kids into unicorns. Invite Your Guests to the Unicorn Adventure With These Invitations! No party is fun and exciting without guests. So, why not consider inviting the guests with unicorn invitations? These invitations feature the same theme from the tableware, but can be personalized for each guest. “A magical adventure awaits” lets the guests know that the party will be adventurous and fun. Now, what little girl wouldn’t be excited and thrilled to receive one of these unicorn invitations to a birthday party? Have any ideas of your own for a Unicorn Birthday Party?